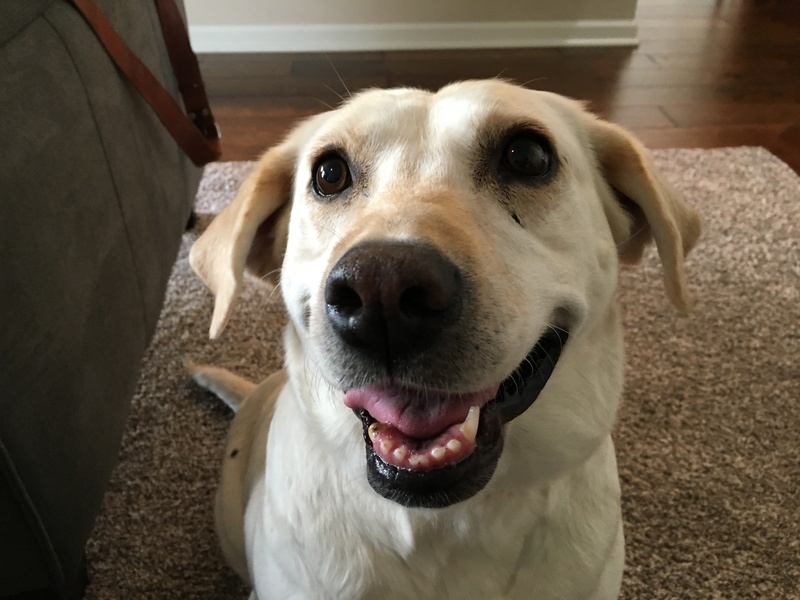 Lola is a three-year-old Yellow Lab who was rescued a few months ago and lives in Omaha with her new family. Her guardians set up a dog training session with me to stop dog barking, help with her aggressive to other dogs, stop pulling on the leash and some basic obedience work. Lola was very subdued when I arrived for the session. She didn’t do much jumping up but this is probably more a result of her having a medium to low energy and carrying a little more weight than we’d like. During the initial consultation I went over a couple of dietary suggestions. Lola’s guardians had been free feeding her and the dog had left the food in the bowl all day long only to eat it late in the evening. But just like humans, dogs can put on unnecessary weight when they eat right before they go to sleep for the night. I showed them how to incorporate structure to meal times and also suggested that they start adding in some chopped up fresh green beans with her dry kibble. The fiber in the green beans helps the dog feel fuller which allows us to feed them slightly less and help take off some of this additional weight. At her age the weight isn’t really a serious health issue now, but over time it will put added stress on her joints and cause some problems down the road. As soon as we started chatting about her day-to-day routine, I watched as Lola went over to one of her guardians, invaded his personal space and demand attention from him by nudging with her nose. I wasn’t able to get my camera out quick enough to capture the start, but Lola initiated this by nudging him with her nose. Lola is obviously a very sweet and loving dog. She clearly enjoys being near the members of her family which is fine. But if you have a dog that doesn’t have a lot of rules or structure, and is able to tell the humans when it is time to pet her, this can help the dog to develop a sort of petulance or perception that they have more authority than they actually do. This is often a contributing factor for dogs that have dog on dog aggression. To help Lola’s guardians start to provide her with a little bit more structure while petting her, I went over my petting with a purpose technique. It’s going to take all the members the family a couple of days before they get into a habit of asking the dog to sit or lay down before they pet her. But once they make this transition, they will be engaging in a mini dog obedience training session every time they pet their dog. For many of my clients who have dogs with dog aggression, it comes from the dog thinking that it is either possessive or protective of the humans it lives with. I went over a number of rules that the guardians can incorporate to help the dog start to identify as a follower. Adding this structure in the home can have a profound impact on the behavior it displayed when outside. It may seem trivial to have a dog sit and wait for you to go up and down a flight of stairs first or out of the door before they do, but to a dog, whoever is in front is literally in the leadership position. So by asking the dog to wait and follow us, we can help it develop more of a followers mindset. For many of my clients, simply adding structure and helping the humans assume more of a leadership role in the dog’s eyes puts a stop to their dog aggression outside of the home. But I also wanted to give the humans some tools and techniques they can utilize just in case Lola does not turn out to be one of those dogs. I spent the next few minutes going over a Watch exercise that I developed after reading Karen London’s book, Feisty Fido. It took Lola quite a while before she started to look up at my face during this exercise. While you can make a sniffle or other benign sound to get the dog to look up at you, I find this exercise is most effective when we simply wait for the dog to look up at our face on their own. Next I had Lola’s guardian sit down with the dog to practice this exercise on her own. Lola had difficulty getting into a sitting position which I believe is related to being a little bit over weight. We went ahead and practiced the exercise with Lola in a down position for now. But I recommend that the guardian try to get the dog to sit while doing this exercise as that is going to be a more appropriate body mechanic to utilize while out on walks. It will be important for Lola’s guardian to practice this watch exercise a couple of times a day in the home until she starts immediately looking at the humans face anytime she hears the watch command word. Once this is the case, the guardians can start incorporating various distractions while she practices. By gradually ramping up the distractions in the house, the guardian will put the dog in a position to succeed and replicate the watch exercise while outside of the home. Because of her weight issue, I recommended that the guardians start walking Lola every day. Because her leash behavior was less than ideal, I pulled out a Martingale collar and showed the guardians how they can apply the special twist of the leash to keep her from pulling. Within a couple of minutes, Lola was walking next to her guardians and a perfect heel with minimal corrections needed. By the end of the session, Lolo was already showing more respect for her guardians personal space, was responding to the new recall command we introduced and seems to be looking up at her humans for guidance rather then nudging them for attention.